Good Humor Me, Classical Music – Little Nightmare Concert. I’m with you…. at the very least the beige has got to go! The brown and beige looks like a sofa from the 70’s! Ick. That blue with orange accents is my favorite. The blue and white is pretty neat too. Like a sofa..LOL That’s a good one! I swear my grandmother had one in those colors. You ‘Ha’ sounds like an agreement:). To me the issue will not be colours. 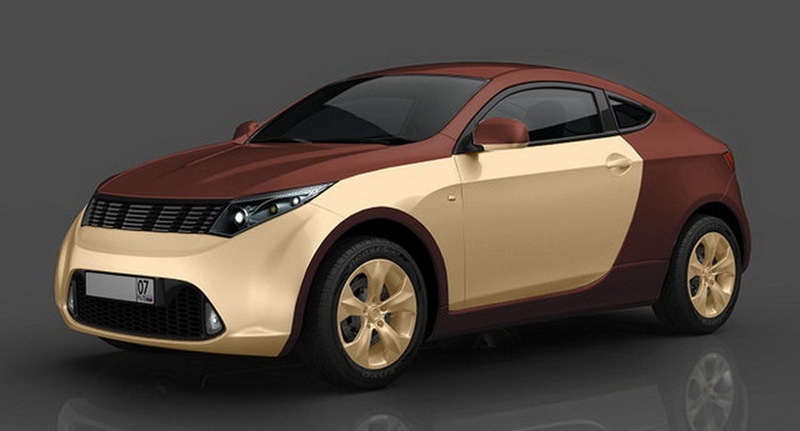 The issue will be overcoming the failure of the Lada to survive the North Amercan market. Shall be interesting to watch how things will unfold. I’m in LOVE with the little red one. My father-in-law (writes and publishes a hydrogen and fuel cell newsletter) is a bit of a buff for alternative fuel cars. I’ll have to ask him what his take is on this. 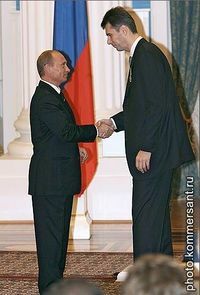 On a different note: I like the way Prokhorov makes Putin look so small. I’m surprised they didn’t stage the photo so the height difference wouldn’t be so noticeable. Apparently, he sent Prokhorov a note but hasn’t heard back from him yet, so he doesn’t have any more info. When did he send him a note? A while back or just yesterday? He said it was earlier this summer. Maybe Mr. Prokhorov just missed your father-in-law’s message? I would love the red one. I live by the beach and we don’t need doors! 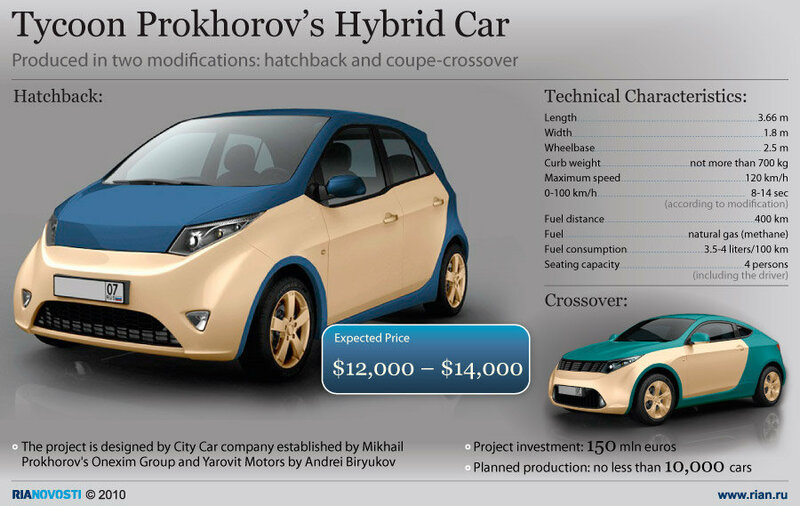 I’m always up for hearing about innovations in cars – you say Russians are conservative, but I also see Americans being really slow to embrace anything besides the 100 year old combustion engine. I would love to go on the waiting list for that red one…. I know… I’ve been eyeing and admiring it too:-). interesting story…and oh,my, what a very tall fellow! i’ll just pass on the car for now…:) thanks! I would like to have heard the nicknames for the first model! Thanks for stopping by my blog! I like the red one! Thank you for your post! Seems like there quite a few of us who would not mind to get on the waiting list for the Red One. Maybe it should be mass-produced after all;). 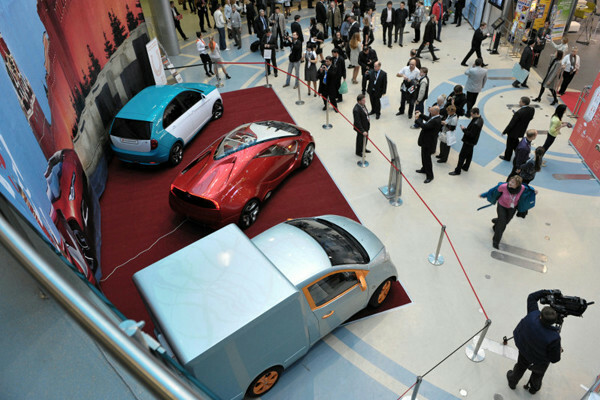 But the cars are so futuristic looking – a very cool post! 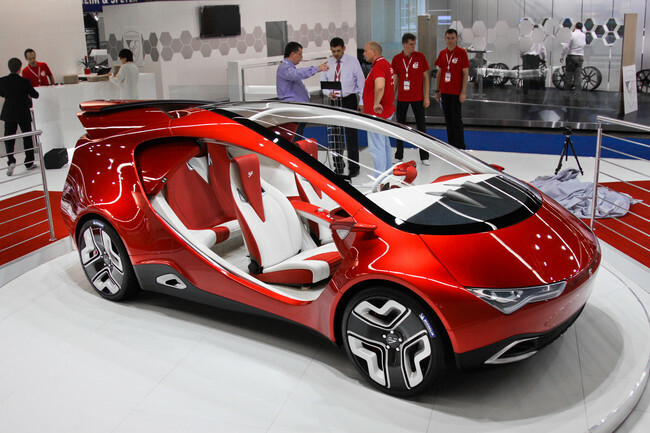 Wow, cool cars! Great post. Glad you’re happy about it. Congratulations! Ooo, enjoyed this! I’ve always wanted an electric car, but you REALLY have to live in a city to use one. A Russian one? 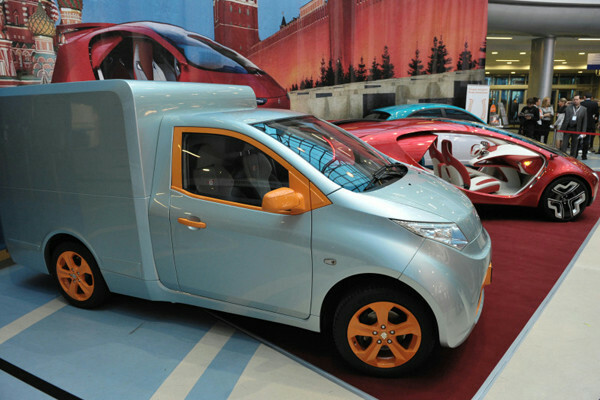 About time….ease those fears about getting electricuted in one. Very interesting! 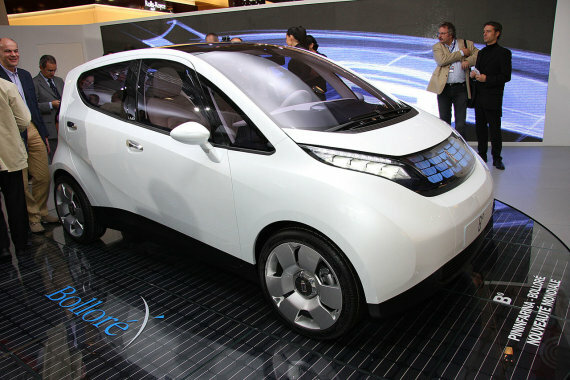 I would love to own a practical and affordable electric vehicle! 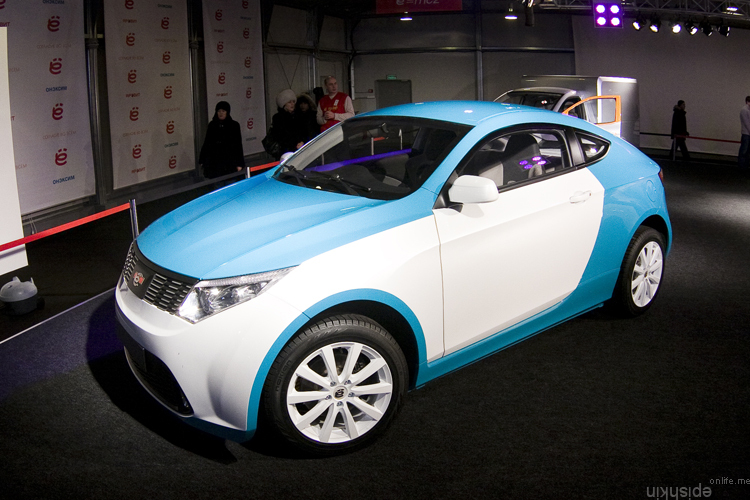 Great to see these pictures – I’ve been wondering about an electric car. I wonder…. It just doesn’t seem like it WOULDN’T leave me stranded…. But I loved the photos. These ones don’t seem to be the smallest electric cars out there. Have your seen a Smart Car? No, I haven’t see a Smart Car – I haven’t seen ANYt of these kinds of cars. It was a truly interesting post to me. Aren’t there any of those on the streets of your City? I am surprised. We have Smart Cars drive and park here and there in NY. And in Europe they are even more popular. New ideas from new places. If they produced the red one, I’m sure they would sell more than a few. How cool! Thank you for sharing! Thank you for dropping by and liking some of my posts! Thanks to you! I’ll keep visiting you:-). Didn’t know about these cars, thanks! I’ll have the red one too. If you already got your red one, you don’t need those;). Thank you for stopping by! Have a great day! I wanted to thank you for visiting and for the follow….It is nice to have you on board…..I will be following your terrific blog as well…. Thanks! I never drove either of those cars, so I can only judge the color choices;). Love the Yo-Mobile. Perhaps they could build a model for exclusive sale in Philadelphia and call it the Yo-Adrian. Would be even nicer to drive that red one;). Very cool and interesting post…I absolutely love the red modern one. I think they should launch those on the US market. The others look to basic to capture my interest….and I think we’ve established that the beige has got to go… 🙂 Thanks so much for following my blog! I’m glad you found me so that I could find you. I love your blog already! Inspiring! I find it interesting the lengths we go to alter how we go from A to B. Possibly we need to consider if A or B are worth being at. A is where we are at and B is where we want to be. Sometimes creating something “better” is a change but not always for the better. I will disagree with you – better is better:-). If you are saying the world is a better place because we have better cars your head is in the sand. The world has 3D TV but we ignore the three dimensional problems that exist. You may feel richer for your smartphone but the world is impoverished by your ignoranhttps://public-api.wordpress.com/rest/?notes_iframece. Nowhere in my post did I say that better cars will make the world a better place. Making the world a better place is so much more complex than making (or not making) cars. But these type of cars that work from green energy actually do contribute to a better ecology. I agree that we are making advances in green energy but it is my belief that people who throw cans into a blue box believe that is enough. They drive to the health club when walking would make the membership pointless. We can all do more but so many do less. I did not mean to insult you thus the big IF at the beginning of my statement. I find that technology is as interested in obsolescence for further purchase than it is in making the world a better place. I think we need to lift our gaze from our phones once in a while and realize there are many who are oppressed at best and starving at worst. If you are saying the world is a better place because we have better cars your head is in the sand. The world has 3D TV but we ignore the three dimensional problems that exist. You may feel richer for your smartphone but the world is impoverished by your ignorance. If they made one that looked like a Faberge egg, it would sell in upscale U.S. markets. Ha, ha… They could have just sold one such car-egg over the Auction, and that would pay off all the expenses…lol Great idea! I hope some day we’ll afford them! :-) Happy New Year! !